A Turn In Uranium And The Best Way To Play It | Energy and Gold Ltd.
Big news for the uranium sector this morning as a new fund is being floated that will raise US$200 million to buy more than 8 million pounds of “yellow cake” U3O8 from the largest uranium producer in the world (Kazakhstan). Paladin Energy Puts Langer Heinrich Mine on care & maintenance, taking 3 million pounds of U3O8 production annually off the market. Cameco Shuts Down The World’s Largest Uranium Mine. Nuclear reactor in central Japan restarted, joins 3 units nearby. Cameco recently announced that it was going to buy uranium on the spot market. Uranium Participation Corporation Completes $23.0 Million Bought Deal Financing to fund future purchases of uranium oxide in concentrates (“U3O8”). Simply put, the uranium price has to go higher in order to bring supply back onto the market over the next several years. The only question is how high must it go before there is a significant supply response – my answer is probably about double current levels (mid-$40s). Even using a US$40/lb U3O8 price NexGen’s flagship Rook I generates an after-tax IRR of 46.2%. The attractiveness of Rook I’s economics really begins to stand out as the U3O8 price begins to move above the US$30/lb mark, a level which might be much closer than it appears – the current spot U3O8 price is US$23.02, however, the uranium fund-implied price (using premium to NAV in U.TO share price) is nearly US$26/lb. NXE also has market cap large enough (C$950 million) that it is able to attract institutional buyers (previously Cameco was the only stock that hedge funds would use to play the uranium market). We have begun to see some early buying in the uranium space in recent days, possibly motivated by a TD Securities comment last week that it is now forecasting a 3 million pound supply deficit in 2018 after previously forecasting a market surplus. 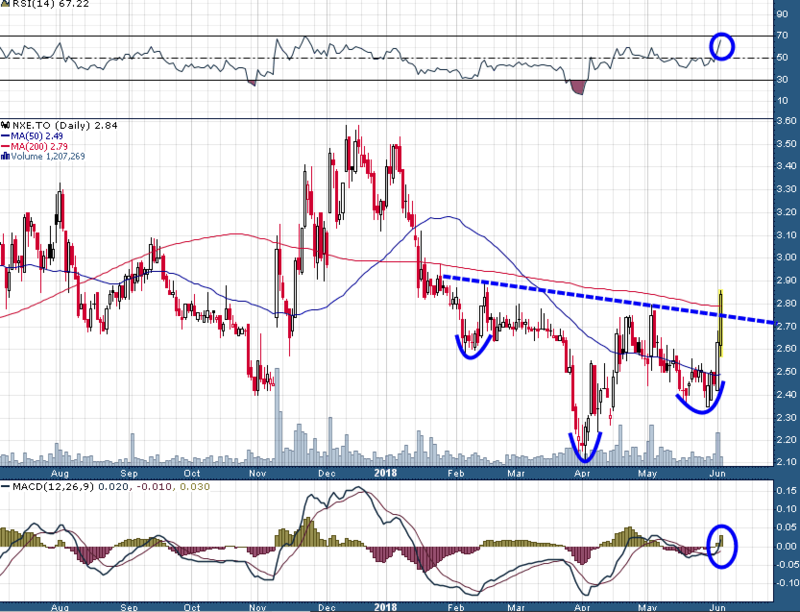 This breakout (over C$2.80), if it holds, would target C$3.40+ over the coming weeks. Considering that the RSI and MACD are just moving out of neutral territory this move could easily reach the C$3.00-C$3.10 area over the near term before a healthy consolidation/pullback takes place. Simply put, the fundamentals and the technicals are suddenly lining up nicely in the uranium sector and NexGen stands to be the “GO TO” name if this turn in the uranium sector proves to be the real deal. Disclosure: Author is long NXE shares at the time of publishing this article and may buy or sell at any time without notice.